I've lived in London for just over a year, some parts of that year were absolutely lovely, and of course some parts were freakishly difficult. One of the highlights, I must say, is the food. I cannot get over how amazing the selection of cuisine is here! 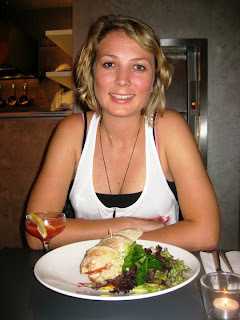 It is not difficult to be a vegetarian or a vegan in this city. It is perhaps, more difficult, to be able to afford everything I want to eat though. That being said, it certainly has not stopped me gaining what feels like 10 kilos since I lived in New Zealand.For my first 6 months here, I lived in a warehouse. One night I made over £300 by running coatcheck out of my bedroom during a rave that was on in the front section of my flat. After waking up at 7pm, groggy and a bit dazed, I celebrated by taking my old flatmate Maddy from NZ out to dinner to Saf in Shoreditch. 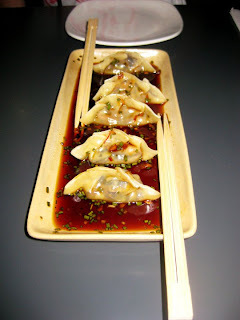 We ordered mushroom gyozas to share. 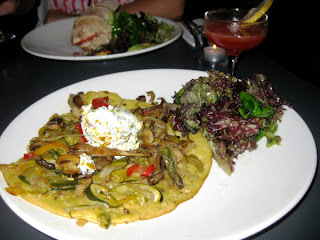 I had the Rustic Farinata: Slow roasted seasonal vegetables and mushrooms in chickpea crepe topped with a tarragon aioli, while Maddy had the tempeh salad. Absolutely delicious and the cocktails are devine.